On Jan. 24, the latest event in SVG’s Regional Platinum Series took place at Sneaky Big’s state-of-the-art studios in Scottsdale, AZ. More than 100 sports-video-production professionals turned out for a full tour of Sneaky Big’s facility, an inside look at the upcoming launch of the Alliance of American Football, a panel focused on at-home production, and a closing reception that helped bring together the thriving sports-production community in Arizona and surrounding areas. The SVG Regional Platinum Series event at Sneaky Big Studios drew more than 100 sports-video-production professionals. An opening session entitled “State of At-Home Production: The Evolving REMI Landscape” addressed how the explosion of at-home productions in recent years has dramatically changed the face of the live-sports industry. While many networks and content creators are using their own facilities as the base for these at-home shows, third-party production facilities like Sneaky Big are also playing a larger role in this evolving ecosystem. The panel discussion – moderated by Bill Hague, EVP of Magid and Associates – featured Chris Brown, Senior Director of Technical Operations at Turner Sports; Tom Carlisle, Senior Engineer at SNEAKY BIG; Michael Davies, SVP, Technical and Field Operations at Fox Sports; and Stephen Wharton, COO & CTO at Skycam. With the debut of the Alliance of American Football just days away, Mark Teitelman, Co-Head of Production for the AAF, gave a preview of the league’s operational plans in a Q&A with Ben Grafchik, SNEAKY BIG’s Director of Business Development, Live Productions. As the league looks to innovate sports in more ways than just on the field, the AAF is set to pioneer in the field of at-home production via its new partnership with Sneaky Big in Scottsdale, AZ. The Regional Platinum Series event also featured a short panel discussion moderated by SVG Chief Editor Jason Dachman, which offered a technological peek inside the facility featuring Scott Beckett, Global Video Services, Director of Product Management at AT&T; Tom Carlisle, Senior Engineer at SNEAKY BIG; Janel Fleming, Sales Manager, Sports at LiveU; and Miles Shozuya, Western Regional Sales, Optical Devices Division at FUJIFILM. 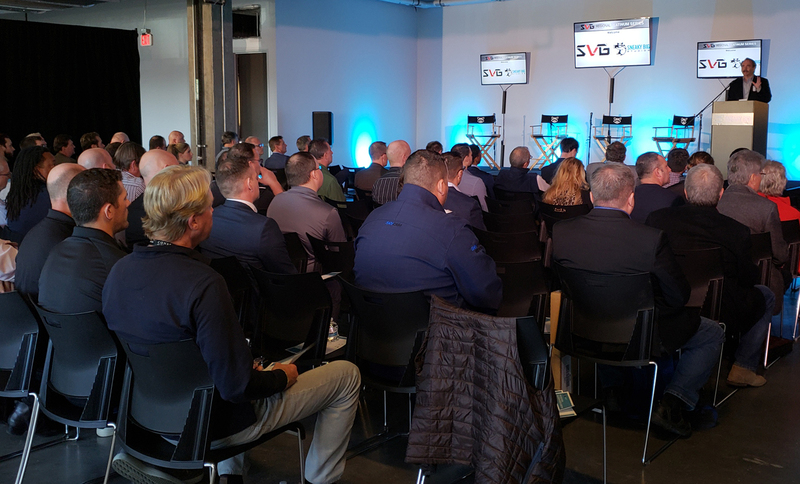 The event was made possible by sponsors AT&T, Fujifilm/Fujinon, and LiveU, as well at SVG’s Platinum Sponsors: AT&T, AWS Elemental, Bexel, Blackmagic Design, Calrec/DiGiCo, Canon, CenturyLink, Dolby, Eurovision, Fujifilm/Fujinon, Google Cloud, Grass Valley, Lawo, LiveU, NEP, Quantum, Riedel, Ross Video, Sony, SOS Global Express, VER, and Western Digital. 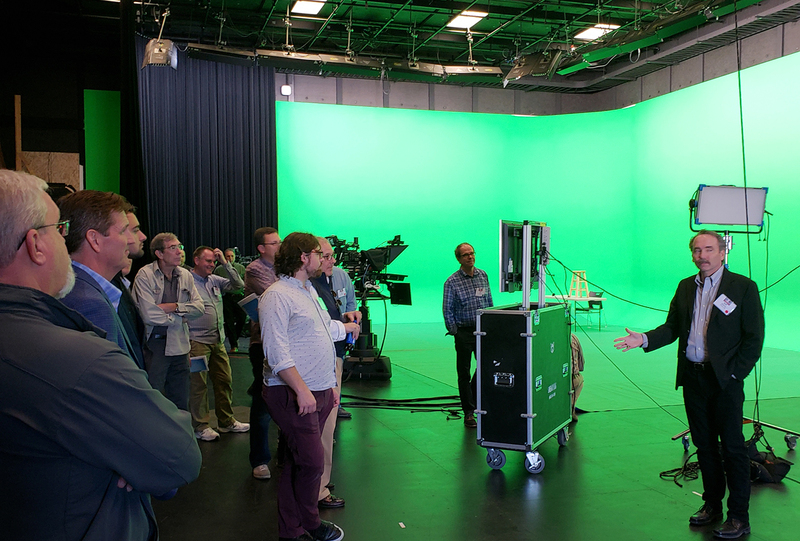 Attendees of the event were given a behind-the-scenes tour of Sneak Big’s state-of-the-art production facility. SVG Regional Platinum Series events foster communication, education, and networking among a specific region’s broadcasters, pro franchises, universities, technology vendors, and other production entities. SVG Arizona is the latest edition of SVG’s series of regional meetups, which include SVG Rocky Mountain (Denver), SVG West (Los Angeles), SVG Florida (St. Augustine), and SVG Toronto. The SVG Regional Platinum Series is open to all end users (video-production professionals working for broadcasters, leagues, teams, universities, digital outlets, etc.) and SVG Platinum Sponsor companies.